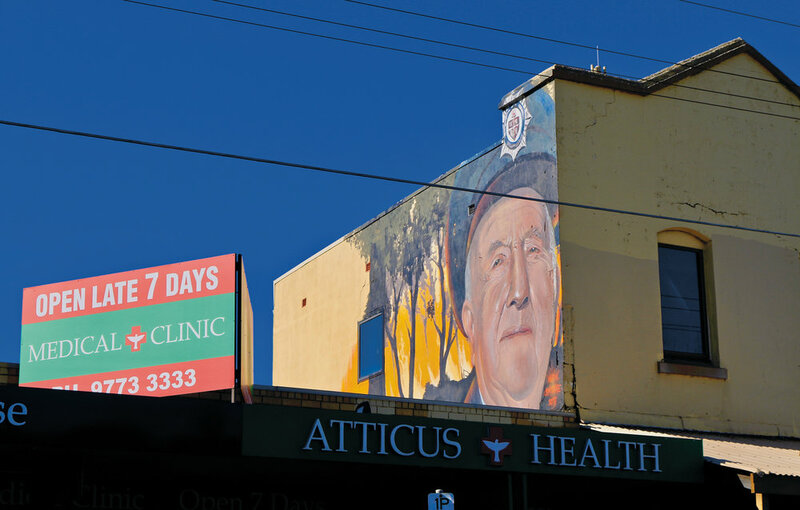 Carrum icon Norm Stephens is now immortalised in Station St after the completion of an art piece at Atticus Health. Norm has been a member of the Patterson River Fire Brigade for a staggering 72 years, and the mural depicts a bold, unwearied Norm in front of the bushfires he once fought. However, his passion isn't just confined to the CFA - he was also treasurer of the Carrum Football Club for 12 years before becoming the club’s president. The Stephens family has a rich history in Carrum. William Stephens was both a councillor and mayor of the Borough of Carrum during the 1920s. Some years after William’s mayoralty, Beach St was renamed Stephens St in recognition of Norm’s grandfather’s contributions to the community, including his involvement in the construction of the war memorial that stands at The Beauty Spot. Dr Floyd Gomes commissioned Project Normie, and the vibrant mural adorns the side of the heritage-listed site on the second storey of Atticus Health. Dr Gomes describes Norm’s contributions as being broad and persistent. Norm is overjoyed with the mural. “It makes you feel quite proud to be sitting up there,” he says.